Chiropractic healthcare is a branch of the healing arts based on the scientific fact that our nervous system controls or influences the function of every cell in our body. Interference to the nervous system (caused by the Vertebral Subluxation Complex or Nerve Impingement Syndrome) will effect how the nervous system relates to the cells to which it travels. The term “Chiropractic” comes from the Greek words “cheiro and praktikos” meaning “done by hand.” The Chiropractic model of health is centered on the philosophy that the human body, being knit together in a wonderful way, will heal itself given the right opportunity and circumstances. 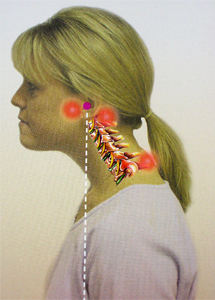 Doctors of Chiropractic (DCs) essentially promote the healing process by minimizing nerve interference. When do you need a Chiropractor? The purpose of the Chiropractic approach to healthcare (the wellness model) is to uncover your health conditions, not merely cover up your symptoms. The absence of symptoms (pain) does not equal good health! The clearest way to illustrate this is by reviewing the statistics on heart attacks. Research reveals that in approximately 33% of all heart attacks, the first symptom of the attack is death! Wellness care encompasses several aspects of overall health, which can be physical, emotional, mental and spiritual. Most people are unaware that today’s Doctors of Chiropractic undergo virtually the same intense education process as Medical and Osteopathic students for the first two years of professional school. Medical students and Chiropractic students alike, spend a tremendous amount of time studying anatomy, physiology, neurology and other basic sciences. The main difference during the first two years is that Medical students have a heavy emphasis on pharmacology (study of prescription drugs) and Chiropractic students emphasize nutrition and natural alternatives to drugs. The programs take a different turn after the first two years. Medical students prepare for the “trade” by rotating each month to different medical specialties such as pediatrics, orthopedics and family medicine. The second two years of education for Chiropractic students focuses on learning the tools of their “trade.” Chiropractic treatment today can be effective using manual and computer controlled care, such as with the ProAdjuster. Both doctors of Medicine and Chiropractic are very well trained to treat their respective patients utilizing the skills of their professions. The most promising and encouraging change in today’s treatment environment is that many healthcare clinics provide both Chiropractic and Medical care for their patients. The Chiropractic model of health is centered around the philosophy that the human body, being knit together in a wonderful way, will heal itself given the right opportunity and circumstances. Forward Head Posture, What is it? Chiropractic care focuses in natural methods to assist the spine recover and reinstate to its prior condition. Chiropractic is a safe, affordable and effective alternative to conventional medicine for many ailments back pain and neck pain, blood pressure, headaches, etc. I believe whole-heartedly in Chiropractic Care for back pain.